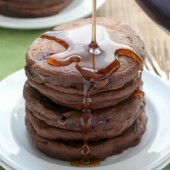 Easy double chocolate pancakes. The perfect addition to every breakfast! In a medium bowl, whisk together pancake mix, cocoa powder and light brown sugar until completely combined. Add water, stirring until mixture is thick and evenly moist. Stir in chocolate chips. Heat a non-stick electric skillet to 350°F. If desired, lightly grease. Use a large cookie scoop to evenly dispense batter onto hot electric skillet. Use a spoon or knife to gently flatten out the batter. Cook for 2-3 minutes per side or until large bubbles appear and pop. Flip and cook for an additional 2 minutes. Freeze remaining pancakes in a large plastic bag, with the air removed. To reheat in the microwave, defrost for 1 1/2-2 minutes, then heat for 30 seconds, or until pancakes are heated through.